So many service experiences these days just don’t cut it. Being “of service” does not seem to be a valued role today. But when we have received exemplary customer service, we felt the difference. World class service set a high bar. And it may have spoiled us for life! Exemplary customer service may be different for different people. We identified 3 groups of key indicators of service excellence. And these aspects of service delivery moved the bar for us. Personalization: Know your client and use that knowledge to personalize the service. Anticipate the client’s needs. Exceed expectations. Build long term client relationships. Don’t just deliver transactional services. Quality As A Core Value: Every facet of a service is designed with quality in mind. Lead by example. Understand that every employee’s role is necessary and valued for delivering quality. Constantly Improve: At every opportunity, get feedback on the service. Listen and respond to client feedback. Use the feedback to continually improve the service. Respond to all problems quickly and sincerely. We have had a lot of five star experiences. But not all experiences delivered on all 3 elements of exemplary customer service. When all three were there, world class service set a high bar. But I will note that not all of our great service experiences happened only at five star brands. Leadership focus on quality has often delivered service that exceeded expectations. We don’t always travel in luxury. So when we looked for a reliable quality experience, we knew where to find them. World class service set a high bar when we found …. The most valued aspect of world class service for us is personalization. When we received personalized service, it left positive memories that we loved to share. It showed that the establishment knew who we are. And that we were not just another number. Great brands use what they know about you to personalize the service. That knowledge let them anticipate our needs. And our expectations were exceeded. This aspect of world class service set a high bar. World class service set a high bar when we felt that brands were building client relationships. Not just delivering transactional services. They want you to come back. And they appreciate the lifetime value that loyalty brings. We often reach out to hotels before we arrive. This is especially true if we have special requests. We understand that hotels get a lot such contacts. So on many occasions, this opportunity to begin a dialogue was ignored. In our experience, this was often an indication that the hotel had a customer service and / or leadership issue. But in virtually every instance where we had communication before and during our stay, the customer service level was much higher. We often get automated email messages before a stay starts. The email asks about special needs. Often it prompts us to set up preferences in a reservation or on our mobile app. Rarely does it really provide an ability to respond to the email with a request. This may look like a personalized pre-approach. But not if there really is no way to respond. 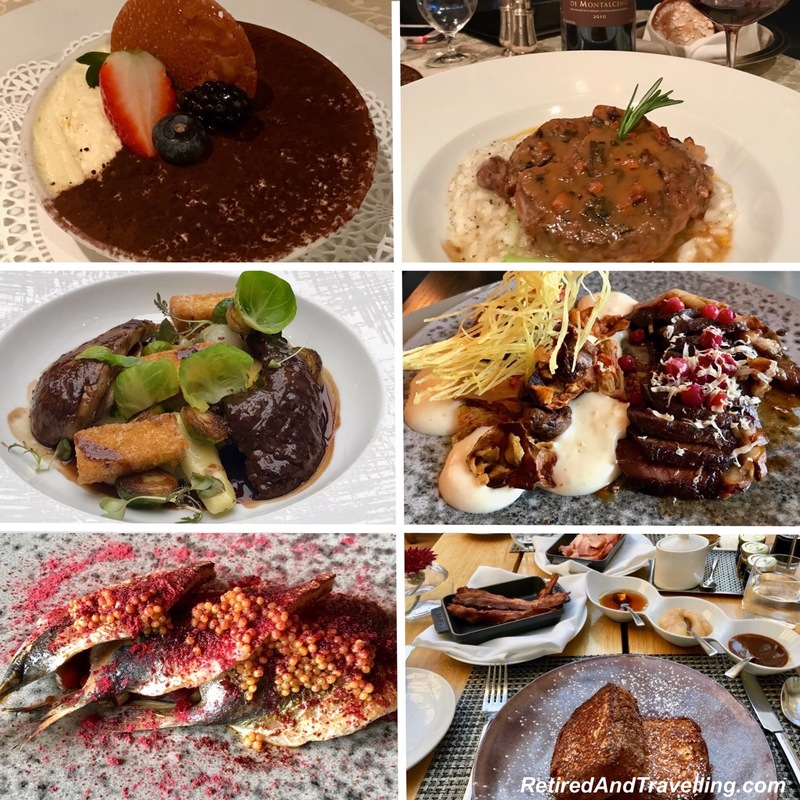 The most delightful experience we had was for our visit to the Ritz-Carlton Montreal. We got what looked like a standard email before our stay. But the next morning, the email was followed up with a phone call to review our stay and all of our needs. We felt so much more confident that when we arrived, we would not be treated as if we booked on some anonymous site. This level of world class service set a high bar. 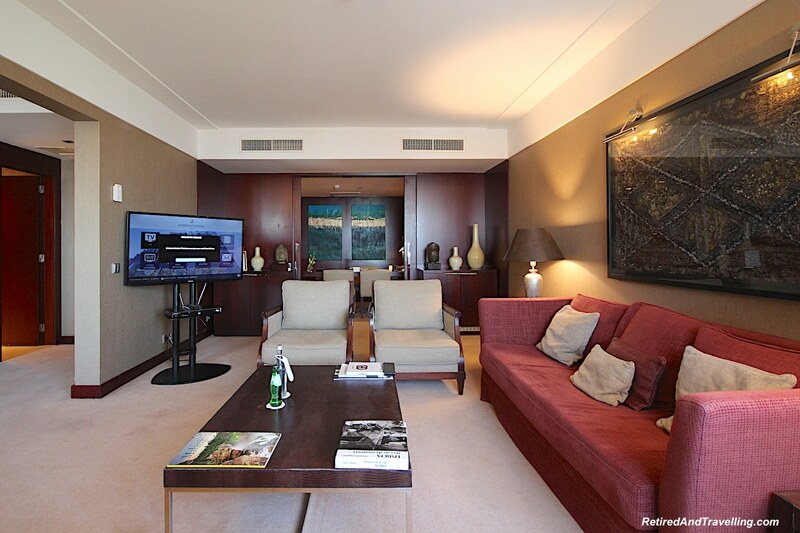 Our first “wow” customer service experience happened when we stayed at the Ritz-Carlton Geneva. We walked from the train station and arrived at the door. It was opened by a doorman who welcomed us by name. At every interaction in that hotel, we were addressed by name. Ritz-Carlton is known for its focus on personalized service. So we should not have been surprised when we arrived for our stay at the Ritz-Carlton Montreal. When the doorman opened the car to our cab, he welcomed us by name. And that happened wherever we were at the hotel. But it wasn’t just knowing our name. It was knowing more about us and our preferences. Anyone who reads our blogs, or listens to David talk, knows that David is a dedicated chocoholic. And we like our bubbly! So maybe we should not be surprised that so many of our welcome amenities or room treats were chocolate and champagne. World class service set a high bar when we felt like we were not just another number. We have been wowed when the service came without even asking for it. 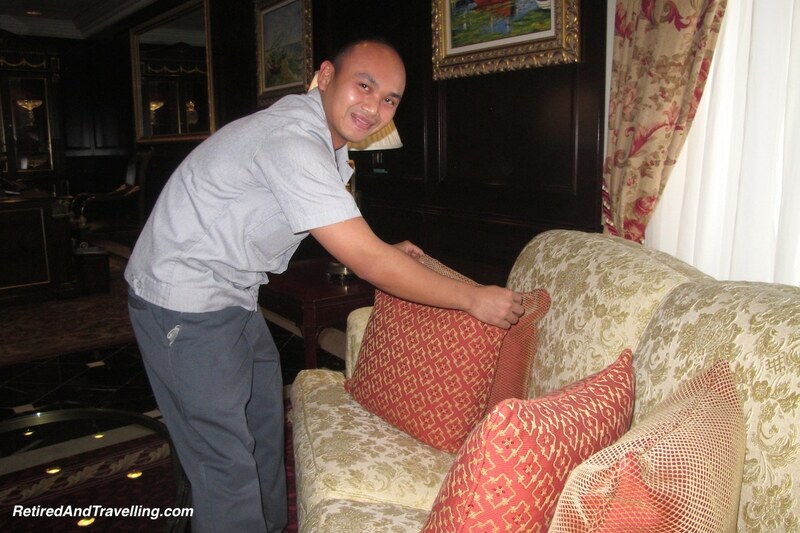 When we stayed in Geneva at the Ritz-Carlton, housekeeping staff were trained to be observant. When they saw we drank more water and coffee than the regular daily supply, double portions showed up. We called down for an extra sheet for the bed. The European practice of not using a top sheet baffled us. We commented that the sheet was because we got hot at night. Without asking, the set point on the thermostat was lowered so the room could get colder. When we arrived at the Ritz-Carlton Montreal, we were given a tour of the beautiful old building. The doorman saw we were interested in the history of the hotel. 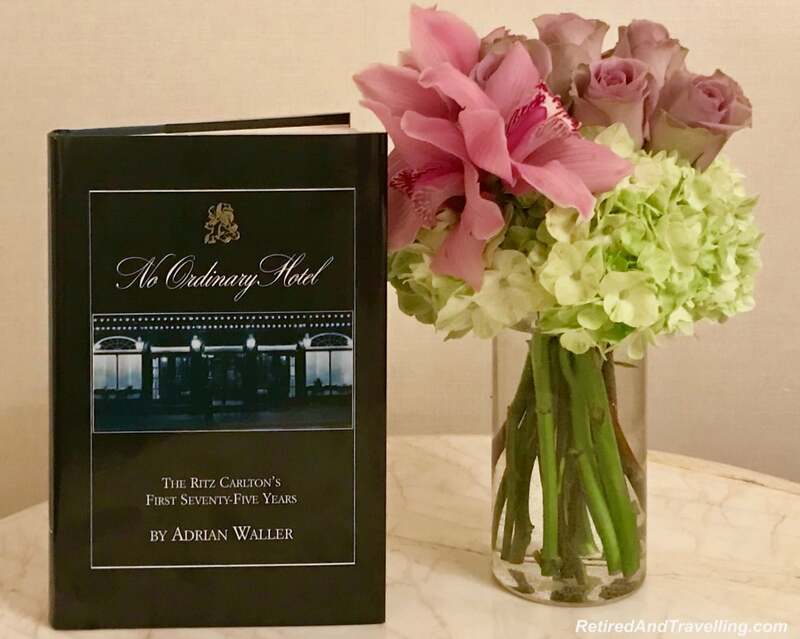 A little later that day, he hand delivered a book signed by the staff on the history of this first hotel ever branded Ritz-Carlton. Proactive service is delivered when your preferences are known. Or when staff pay real attention to your comments and requests. The immediate needs were not just met. The underlying issue was identified and fixed. 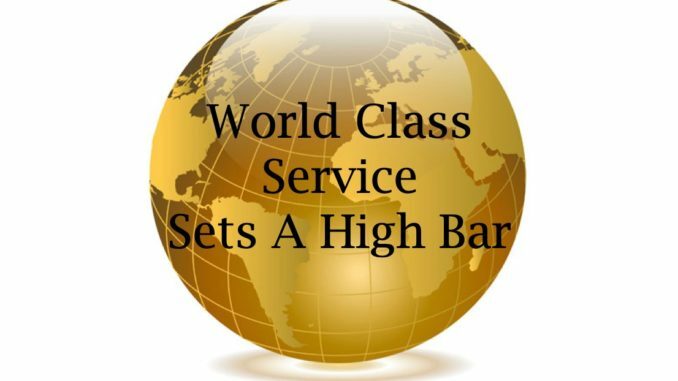 When we don’t need to even ask, we know that world class service set a high bar. We stayed at so many five star hotels on our travel in China. 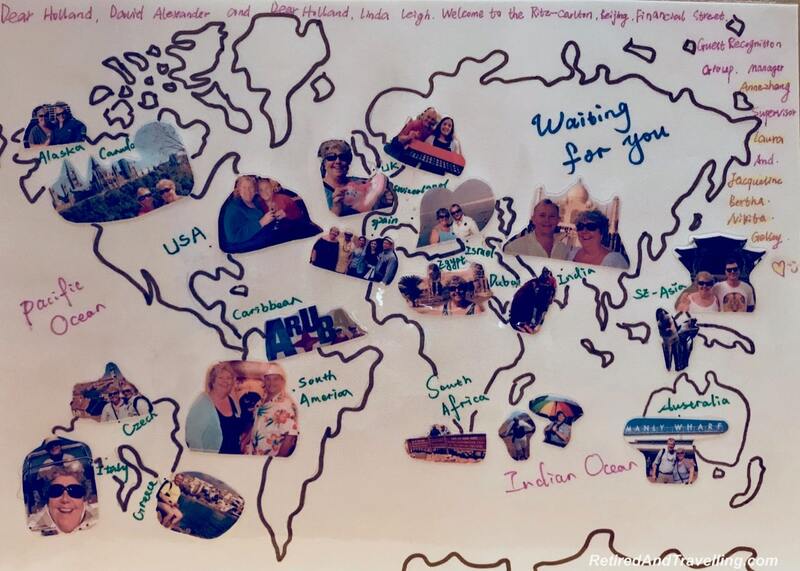 There are so many examples from that trip where our welcome exceeded expectations. But the trip to China was a bit unique in a few ways. First, we travelled with Viking Cruises and they booked most of our five star hotel stays. And we stayed in some five star hotels where we had no rewards loyalty status. Both of these factors meant that loyalty perks from high reward status could not be counted on. But regardless of whether we booked hotels directly or were loyalty members, we were delighted when the world class service set a high bar. 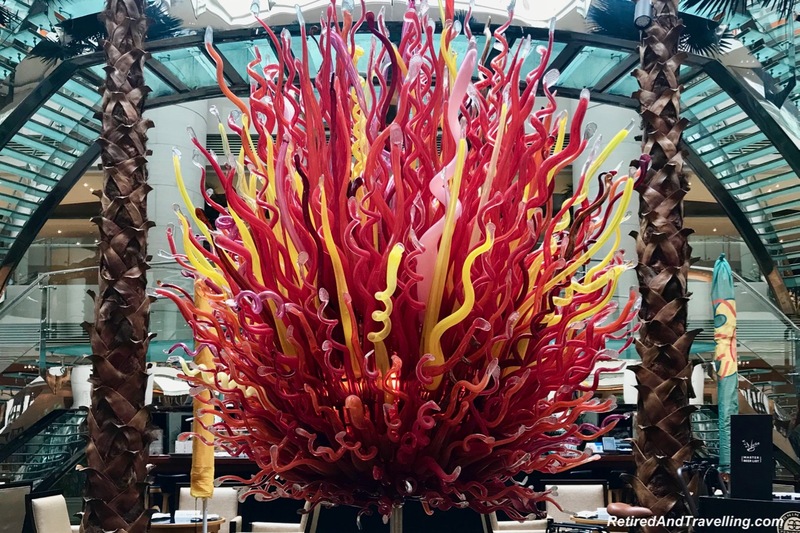 Customized hotel amenities created distinct memories of these hotels. In Chengdu we saw the panda bears. 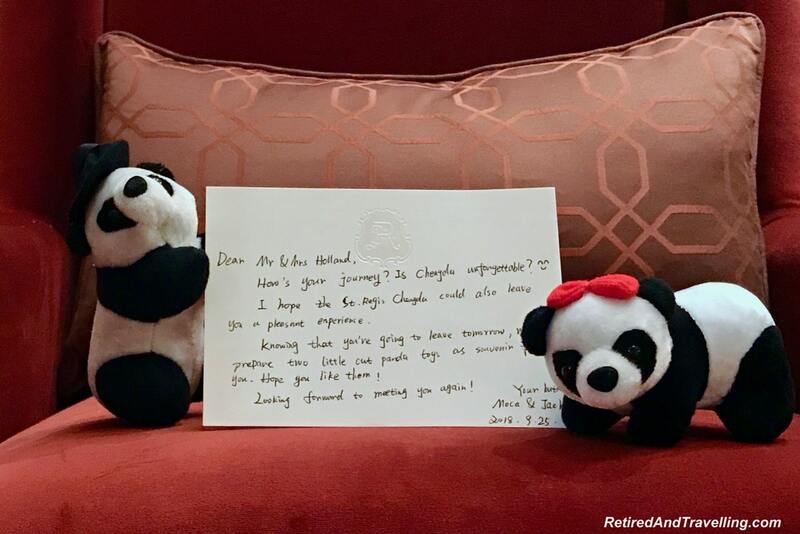 So when we stayed at the St Regis Chengdu, we were welcomed to our upgraded suite by a pair of stuffed panda bears. In Xian we saw the Terra Cotta Warriors. So the Wyndham Xian made sure we got a chocolate warrior. And a warrior statue to take home. 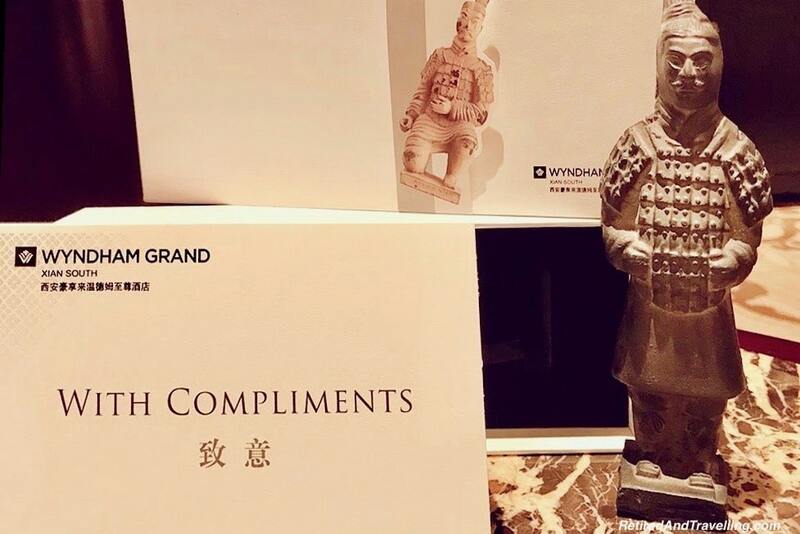 The leadership teams at two hotels in China took personalization to another level. 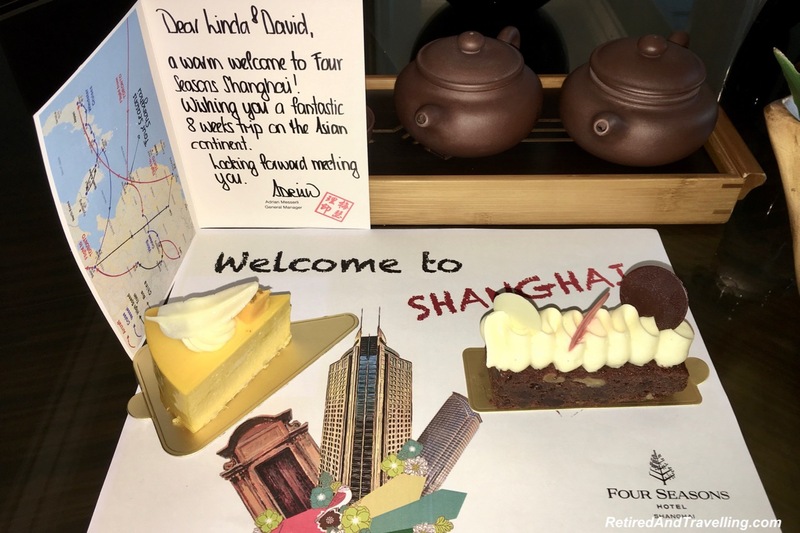 When we arrived at both the Four Season Shanghai and the Beijing Financial Street Ritz-Carlton, we got customized welcomes that clearly showed that the team had read our blog. We got a card and laminated maps that welcomed us to their cities. Overlaid on maps of our own travels. This world class service set a high bar. To this day, I remember being welcomed in the morning at the Intercontinental Bali. The great cappuccino expert always did something special! We are both huggers. While we appreciate a professional handshake, we know that our experiences were a bit more personal and meaningful if it was sealed with a hug. We love when we meet new people who seem to know who we are. When we stayed at the Ritz-Carlton Financial Street Beijing, we got a big hug hello. Their approach to personal service meant they knew so much about us by the time we arrived. So a hug was the perfect way to say hello. 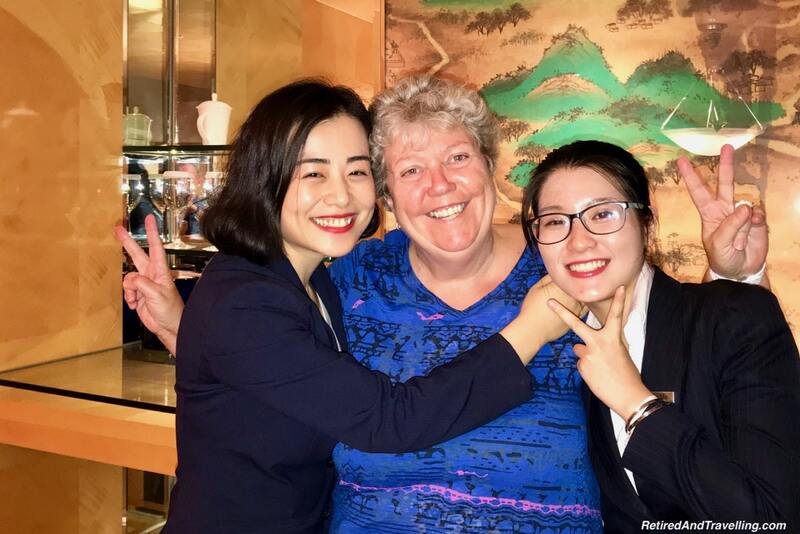 When we cruised with Viking Cruises in China, the Hotel Manager of the ship was on top of every element of service delivery. He was always there to welcome each guest back from an excursion. And to chat about our day. It was clear he cared about every part of our experience. 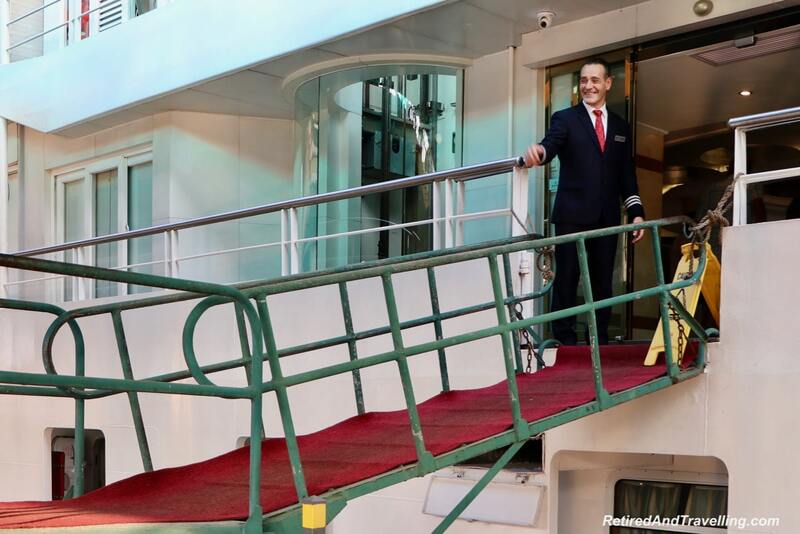 When we cruised with Oceania Cruises around Cuba, we recognized so many of the staff members. Many came up for hugs. And they chatted with us every day. It was great to be recognized as a return and valued guest. World class service set a high bar when we felt like we had returned home and were welcomed with open arms. We are always curious about what information and how much is captured about us. As a senior executive with a major Canadian bank, we used CRM (Customer Relationship Management) systems to track purchases and activity. It is a pretty common practice for all major brands. Loyalty and rewards points systems capture additional information. But what do they capture about our preferences? And how is that information used. When we asked, we did not got detailed answers. And we are sure it varies by both brand and specific establishment. A few experiences we had highlighted this. We talked to a General Manager at one hotel about information captured about clients. He noted that the brand uses a CRM system. But at his hotel, he had staff capture additional notes. Every interaction was seen as a chance to learn more. We were told that even the pool staff made comments into the system about our preferences. When we stayed at another hotel, we were sure that notes were being taken about what we were doing in the hotel. Staff at the front desk would ask us about our dinner, minutes after we left the restaurant. When we questioned one person about this, she showed us her phone. On it was a message that showed we had received a complimentary shot of limoncello after our great Italian meal in the hotel. This really showed a focus on knowing what your customer has experienced. Capturing information to sell you something is a common practice. But capturing information so that your visit can be personalized is so much better. World class service set a high bar in organizations that could collect valuable information. Especially when it was used to delight us. Mission, vision and value statements set the aspirational goals of a brand. When they are consistent, you should feel the core value. When the core value of a brand is “quality”, we saw that in every facet of the product and service delivery. We saw that delivering a high quality experience was the job of everyone we interacted with. And every employee’s role was valued for their contribution to delivering quality. Being “of service” was something that the staff took pride in. It is easy to start with the five star brands and look at the beautiful places we have stayed. Five star hotels and cruise ships know how to create an environment that is classy and elegant. But design is not enough. That shining facade needs to be kept fresh. High staff-to-client ratios let the five star brands focus on ensuring that the facility always looks at its best. But we have been to immaculately maintained mid-range properties as well. A first class hotel is easy to spot the minute you arrive. There is someone at the door to welcome you and answer any questions you have. The lobby exudes luxury and elegance. Elevators and corridors are designed and decorated with style. Tasteful art is used to enhance the atmosphere. When we travel, we enjoyed some of the best food. We cruise with Oceania Cruises because they consistently deliver “the finest cuisine at sea”. We found that the food in truly first class hotels is worth staying in for! Some our best meals have been served at hotel restaurants. We have always been impressed with Oceania Cruises focus on maintaining beautiful common spaces. It seemed someone was always polishing or straightening something. And it seemed that everyone had a hand in this. We saw General Managers stop to fix something as they passed by. But it was easy to see when a brand or an establishment lost focus. 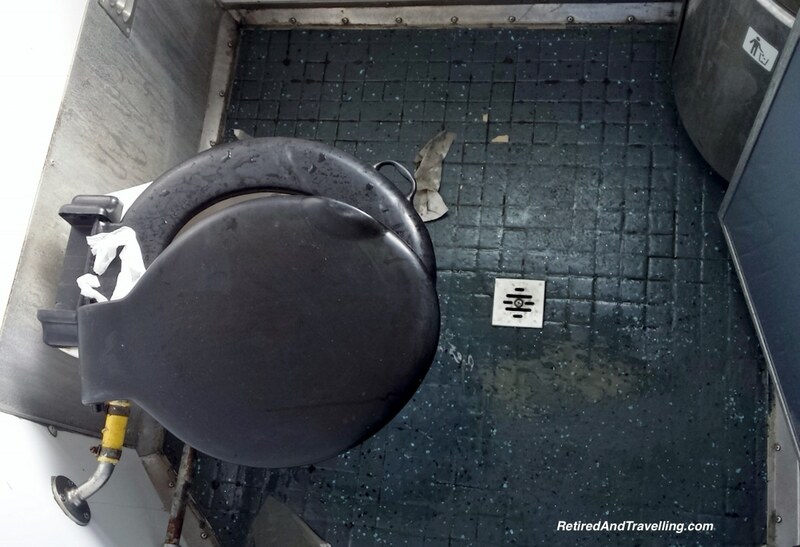 We found bathrooms on a train in Italy that were disgusting. A cruise ship that looked like it was rusting while we watched. And hotel rooms with mold. Not a world class image at all. Keeping a property clean and maintained are basic requirements. When even that is missing, it is not hard to know that customer service focus will slip too. A truly clean, beautiful and serene hotel property will enhance the sense of luxury. World class service set a high bar when it was delivered in a quality environment. 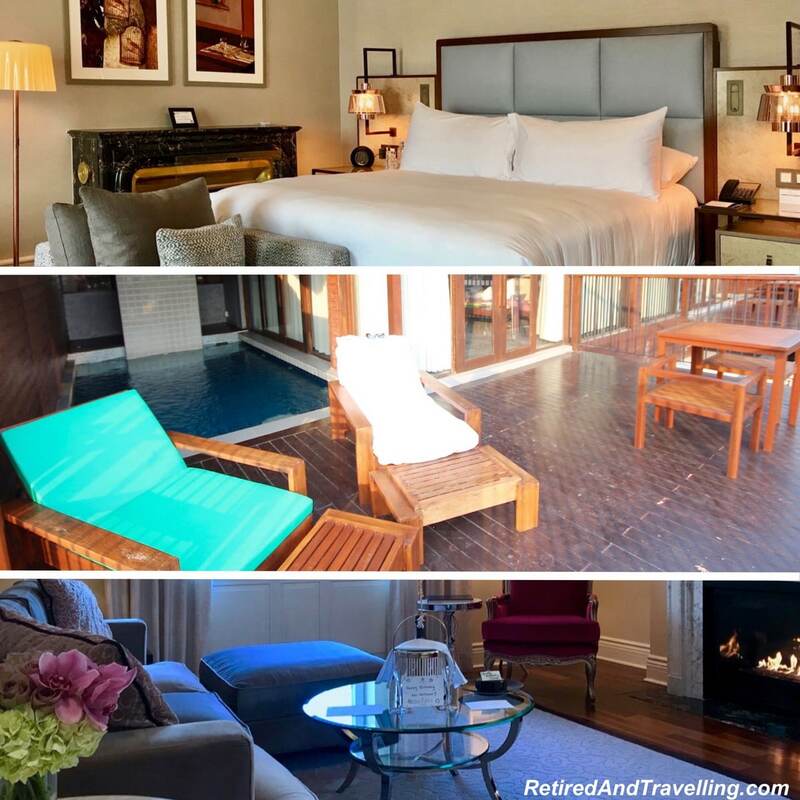 On our travels, we received some of the most amazing sweet suite upgrades. Our focus on greater travel points and status has helped. But even in hotels where we have no status, a suite upgrade has been a treat. 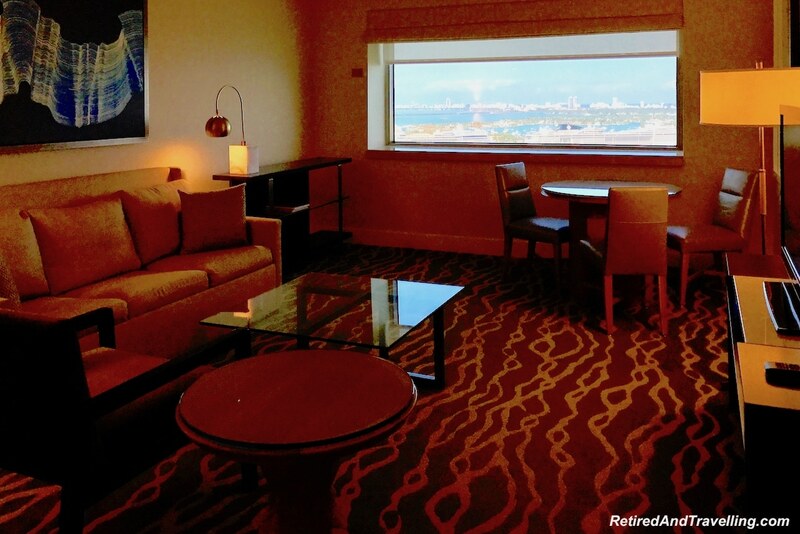 We have been delighted with suite upgrades at the Intercontinental Miami when we started our cruises there. And when we finished our trans-Atlantic cruise in Portugal, the Intercontinental Lisbon offered the most amazing suite upgrades. On our tour of China with Viking Cruises, we often spent very little time at the wonderful hotels we were booked in. Some might say that a suite was totally wasted. But we loved that we had upgraded room to spread out and relax when we arrived after a long day. And the beds were heavenly. Our final stay in Beijing was at the end of our 8 weeks in Asia. And we definintely needed a break to relax. 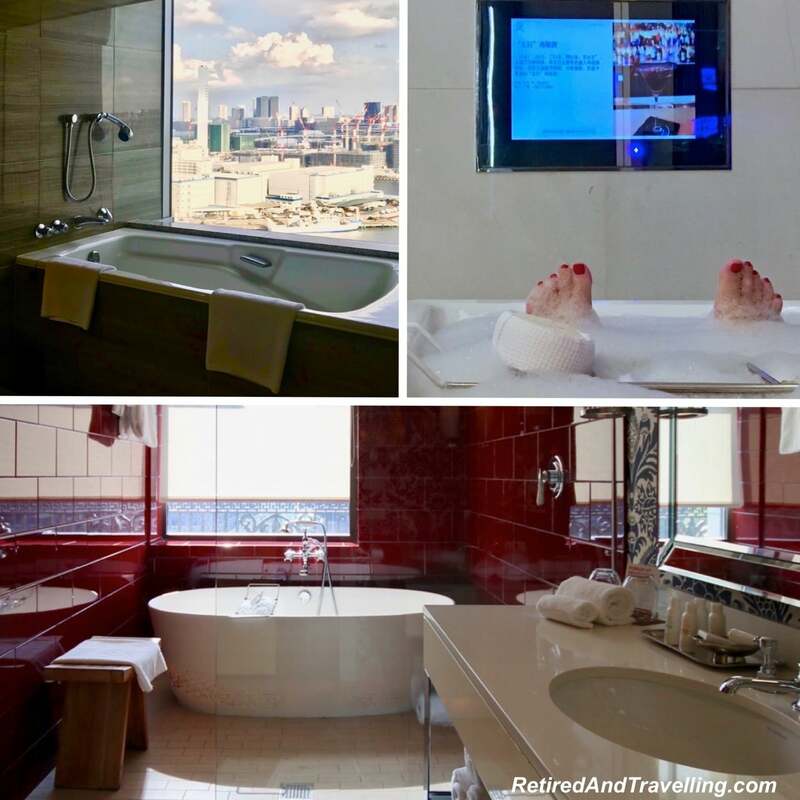 All of the exemplary first class stays during our visit to Asia included big bathrooms with deep soaker tubs. The tubs were stocked with bath salts. Classy bath products were provided in multiple spots. I could really relax and feel pampered. 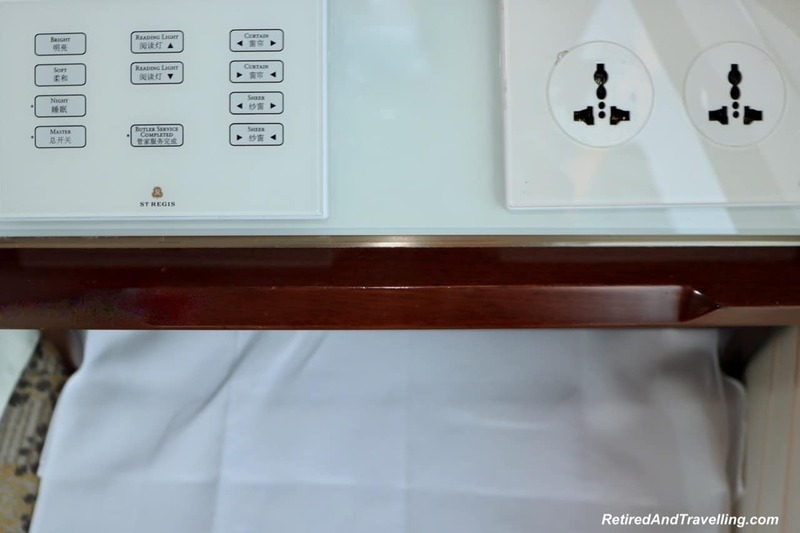 Some of the hotels had the greatest set of electronic controls for everything from the drapes to the lights to calling for the butler. I need to write a whole blog post on the toilets in China and Japan. On our stay at the St Regis Chengdu, we had a truly five star toilet! 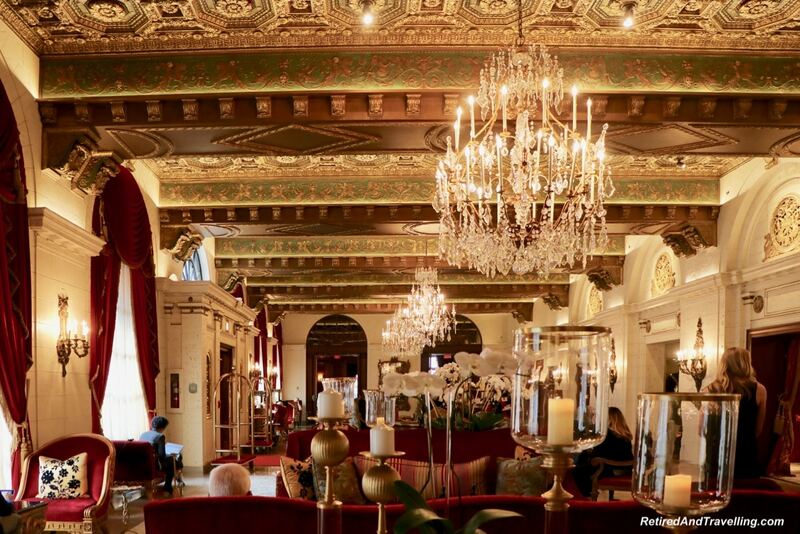 We were definitely impressed when we stayed at the Ritz-Carlton Montreal. 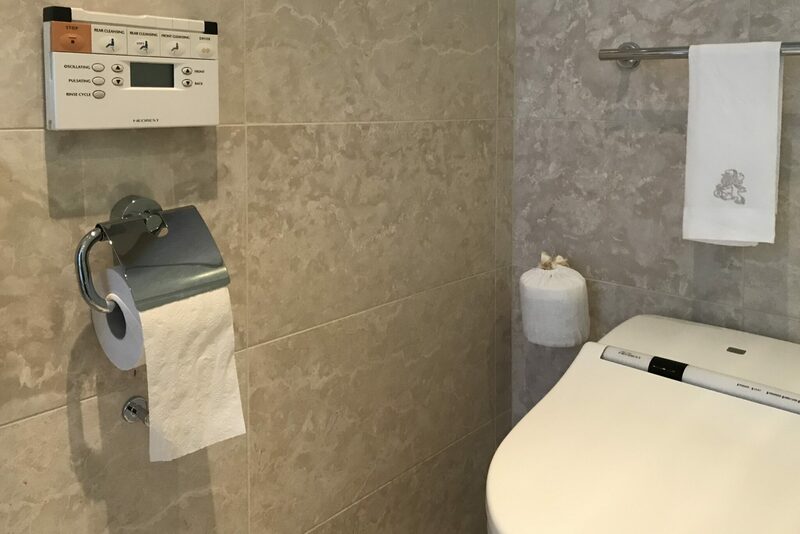 During the recent upgrade, the rooms were fitted with all modern electrical gadgets. And great Asian toilets too! Sweet suite upgrades were a very welcome treat. This world class service set a high bar when we felt pampered and relaxed. World class service set a high bar. And then kept looking for ways to get better. We were asked for our feedback on a regular basis. But getting feedback was not enough. We were impressed when we felt that people listened. And used the feedback to improve. Not every experience was flawless. Some first class brands dropped the ball badly. But how service recovery was done left a lasting impression. We have written about this before and it bears repeating – service quality excellence is all about leadership and it starts at the top. A focus on quality needs to be modelled by senior leadership. We have seen the most exemplary customer service when senior leadership is visible and actively interacted with guests. We have seen that focus on delivering quality move down through the chain of command. Every team leader watched to constantly ensure that everything was ok. That pride moved to everyone who was part of delivering a quality experience. 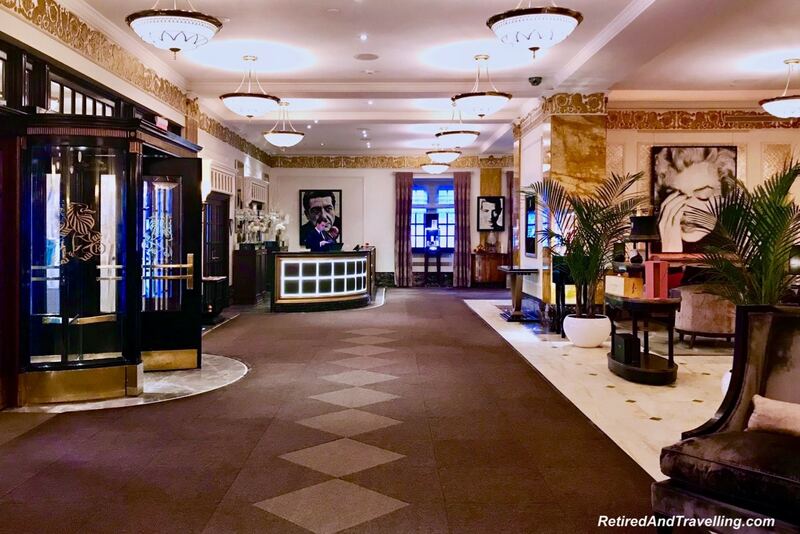 On a recent stay in San Francisco at the Hotel Adagio, we were impressed when virtually every staff member we met asked if our stay was going well. Whether it was the guy moving mattresses into the elevator or the person seating us for breakfast, it seemed that everyone wanted to make sure everything was fine. This hotel knew that every touch point could make a difference in our view of the hotel. There is such a focus on customer experience that we have started to look carefully at business cards for people we interact with. We love when we see job titles like “Guest Recognition Manager”. World class service set a high bar when every person believed that they played a role in delivering exceptional customer service. Most organizations take every opportunity to send out surveys to get feedback. Too many times, it is done to cull for good reviews to post on review sites. We have spent a long time completing guest survey forms. But we much prefer to provide direct feedback to an organization. 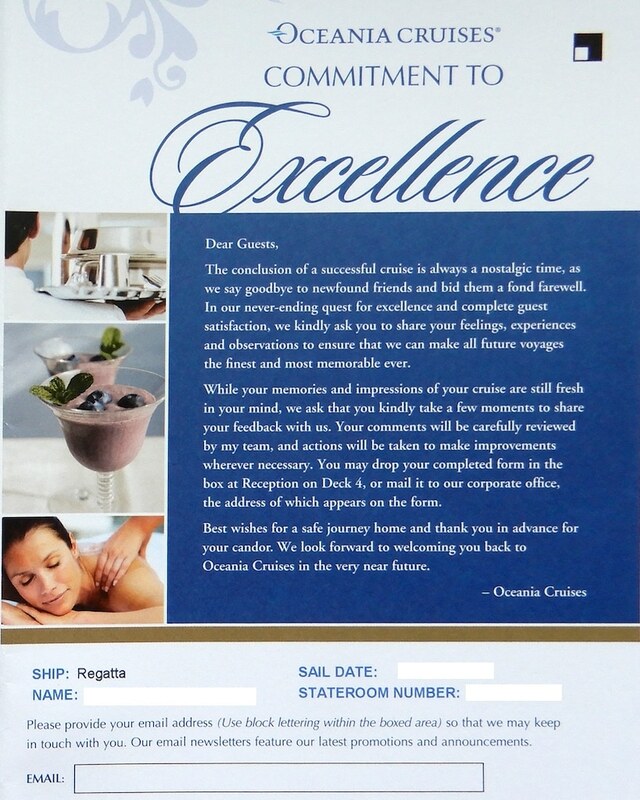 We know that Oceania Cruises reads even the early reviews and posts them for staff to see. More than once we have been chased down to provide more information on a comment we made. But we have also had situations where detailed feedback was argued, even when we provided direct proof of an issue. That certainly did not endear us to keep providing feedback. And most of the time it seems like feedback is entirely ignored. Disappointingly, we have had stays where we were never asked how the visit was going. Not once during our stay at an expensive hotel in Napa did we get asked about our stay. When we checked out, we were not thanked for our visit or asked if it all went well. My feedback on their customer survey certainly did not generate any kind of follow-up. Why would we return to this hotel? On the flip side, we stayed in hotels where we were constantly asked if things were well during the stay. When we stayed at the Intercontinental Hong Kong, we had a maintenance issue. We received several follow-up communications to make sure the issue did not re-appear. And sometimes practices vary widely from one manager to another. We had great follow up on a maintenance issue when we visited Philadelphia for July 4th. But when we reported restaurant issues on a survey, there was stone cold silence when we provided details that the restaurant manager asked for. 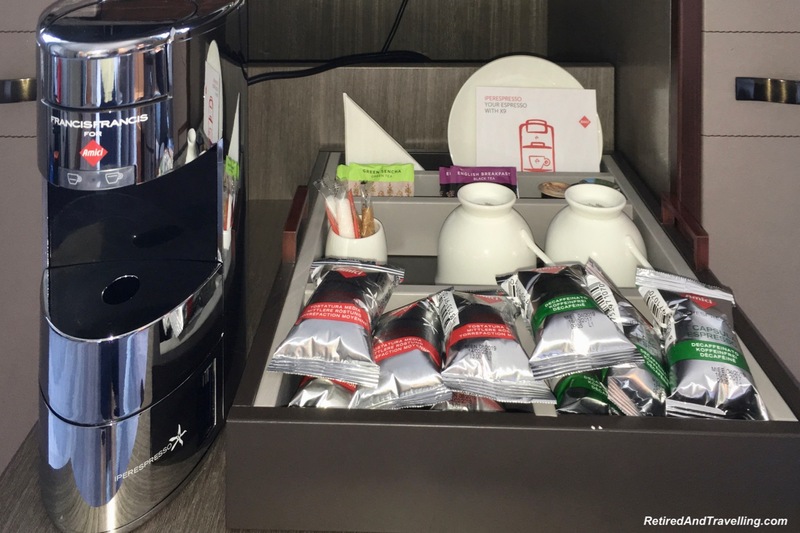 We have always been surprised and delighted by the service we received at Holiday Inn Express brands. This is not a five star brand. But they have delivered a consistent level of service from hotel to hotel. They are one of the few brands that always asks regularly about our experience. Someone must be listening to ensure the follow-up is so consistent. We are happy to take the time to provide balanced and construction feedback after a service experience. World class service set a high bar when organizations went looking for feedback. And there was follow-up on the input received. There have also been times when a brand known for first class service dropped the ball. On one Caribbean resort stay, virtually every part of our visit was horrible. Even when we had almost the top room class because we booked very late. Not once during our stay did anyone ask about service. We provided constructive feedback to the hotel. Which was ignored twice. But when we finally made contact with the General Manager, he called us at home within a day of our email. He was appalled that our feedback had been ignored. We received a great credit that got us a wonderful visit at another property in the brand. But that was not our intention in providing feedback. We truly believed the brand image had been horribly tarnished on our stay. We felt some responsibility to bring it to leadership’s attention. And it turned out that the service issue happened when the General Manager was away. How else would he know that service slipped when he went away? The service recovery in this instance was excellent. We returned to a brand that had been badly tarnished. And returned again a third time. Excellence in service recovery is one way that world class service set a high bar. It certainly helped with our customer loyalty. We have identified three key themes that we believe drive true five star service. Personalization made us feel unique and special. A focus on quality in every element of service delivery showed a pride in the organization. We may get room upgrades and great welcome treats due to our focus on getting high loyalty status. But that has not always meant that the customer service delivery was at the same level. When exemplary customer service was delivered at every interaction point, it reinforced quality as a core value. Getting feedback and responding to feedback on a timely basis ensured that the great service continued. And got better. World class service set a high bar. It spoiled us for accepting mediocre service experiences. We will go back over and over again to brands and destinations where we have received exemplary service. Won’t you? 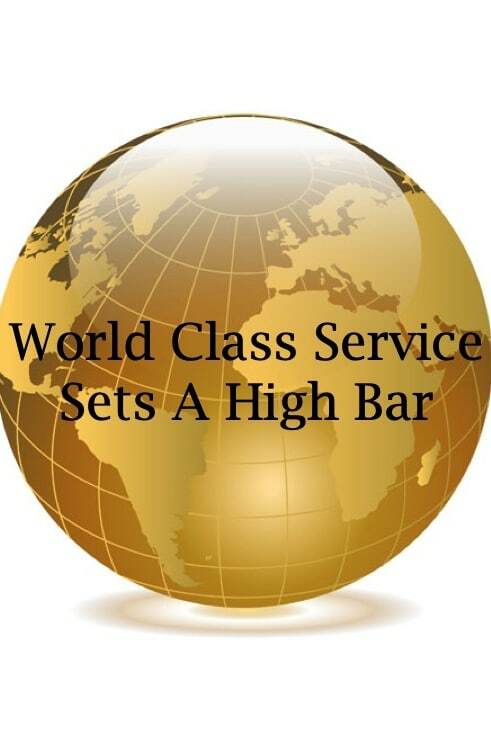 What are your key indicators that show the world class service set a high bar? Do you look for exemplary customer service? And do you stay away if it is not there? This is such an interesting post! For me you only notice when world class service is missing, but actually recognising the effort that goes into providing it, I feel that I should be noticing and commenting on it more! Just personalization for me. I want to set a clear division between world-class service and luxury. I would prefer the former but do enjoy the latter, too. Those are truly what sets a high bar and people that pay appreciate and expect special attention and services from start to end. I would love to do more luxury travel in the next few years. I used to work in Customer Service and we were taught that ‘a smile is free’. World class customer service isn’t actually hard to achieve – as you say, that personal touch makes all the difference. 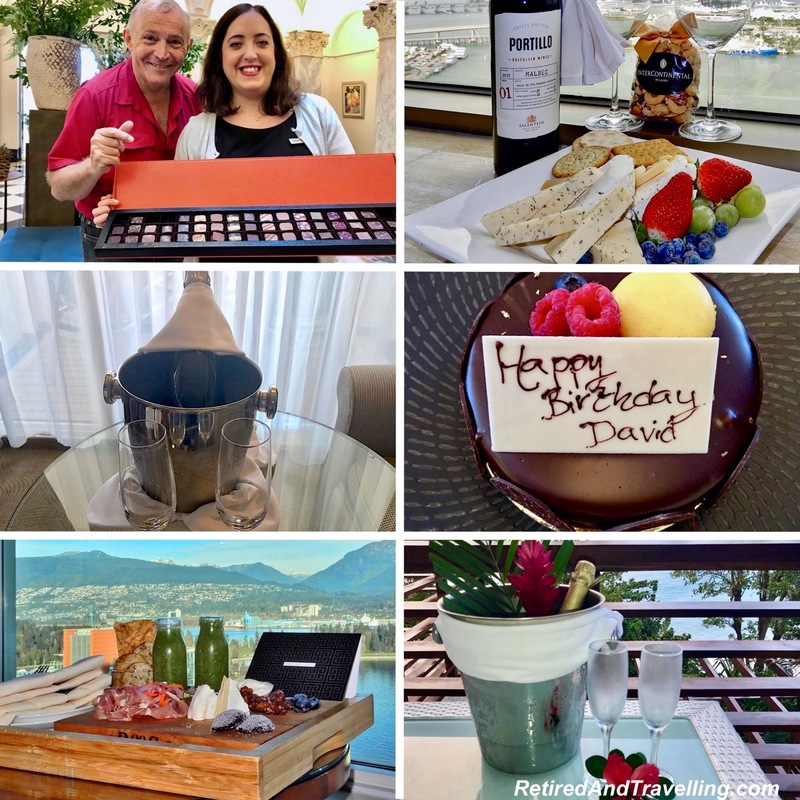 Love your experience at the Ritz Carlton in Geneva – stellar service! I absolutely agree that personalisation is key for good service. Every hotel we’ve stayed and tour we’ve done that we really enjoyed were personalised and intimate. 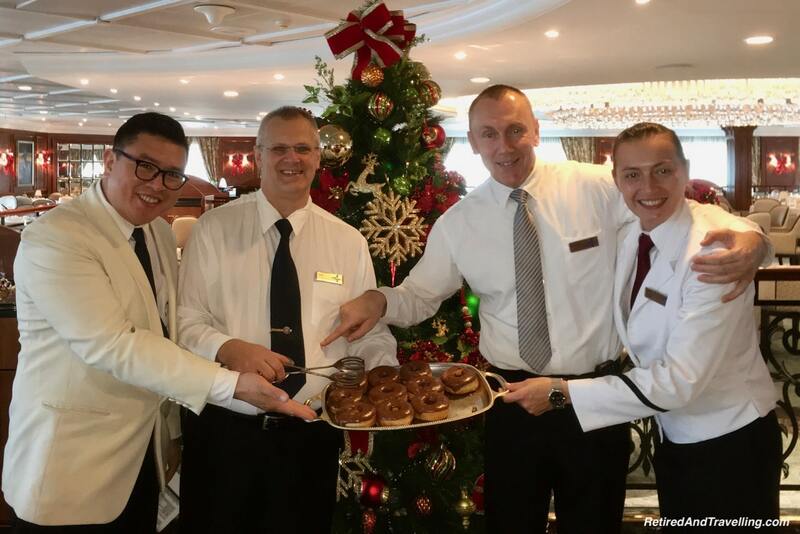 I’m glad you found good food at Oceania Cruises. It can be hard sometimes to get decent food on a cruise. With so much competition in travel industry it is essential the service providers deliver their best. A small negative feed back can snowball to a disaster for the company. You have very rightly pointed out the factors critiqued. Great pictures to prove your point. Great breakdown on world class service. It was very interesting to read the different ways you had been treated. I loved seeing the personalization you received in China. I look for great customer service but my expectations depend on the location. It’s such a great experience when you stay in a place, and you feel like everything is done to please you. To be called by name or to be spoiled with our favorite sweet is a real privilege. It’s the little details that you mention that make all the difference, and I couldn’t agree more when you say that every staff member is a brand ambassador. You are right world class service is a must. I have never had a coffee with my name in it before! I think I need to check out a Ritz Carlton asap. Everyone defines luxury and world class service differently. Perhaps getting to experience both it would be an easier thing to see. Personalization is big for me, I love feeling special and not just another number! This made me think of an upcoming ski trip we have at Beaver Creek next week. A few days ago, I received an email from the lead concierge encouraging us to reach out for special requests. They provided an email and number to a specific person should we need anything prior to arrival. We have stayed at many five star hotels and this is the first time I have been given direct contact information ahead of time. This may be my first experience with world class service! With Service based industries getting stronger day by day, to stay competitive one should be creative. Customer delight is the new jargon. I loved reading your thoughts. For me I look for that smile and the eagerness to go that extra mile to solve a problem in any kind of situation. Brands should remember that at the end of the day word of mouth publicity is the best and cheapest forms of publicity. I work in the hotel industry and have it always in my mind to go above and beyond and to anticipate every guest’s needs. I remember one guest came for their child’s bday and we heard he loved Godzilla. We went out and decorated the room with everything we could find related to Godzilla including making a cake. 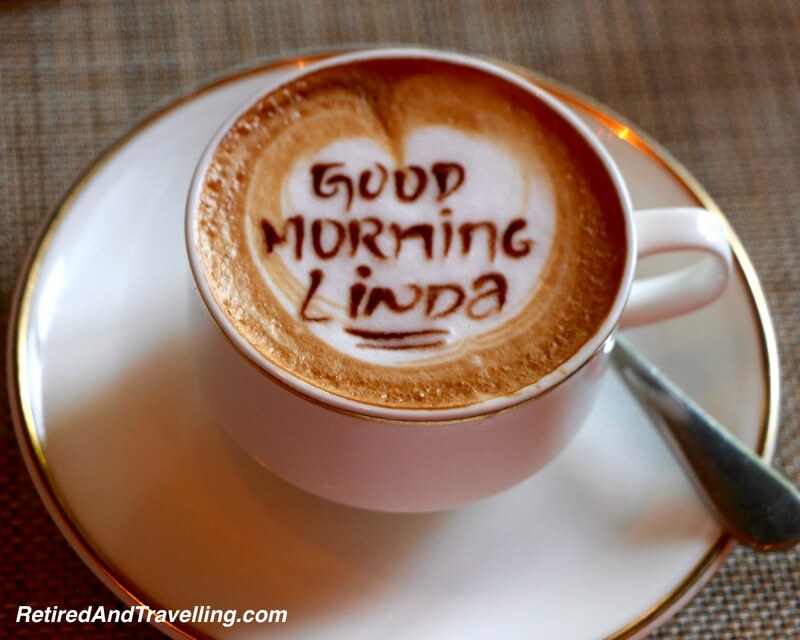 Every little extra thing even just greeting a guest by name can make their entire trip. I’ve gotten so many personal gifts from repeat guests for giving them excellent service. It’s satisfying to see the look on their face.